Our policy is that no job leaves County Blue until it is… Finished! Our mounting and laminating services put the finishing touch on any type of print, giving your final product a polished look. 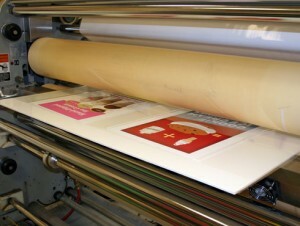 Mounting of prints, photographs, or promotional graphics provides a rigid support and professional presentation. Images can be one-sided, or mounted back to back for a double-sided display. Our expert mounting specialists can cut out your image to create unique displays limited only by your imagination. Lamination protects your artwork from fingerprints, scratches, and fading. Once a piece is laminated, it can be wiped clean of dust and spills. Your graphic will be more durable and can be used for years to come. 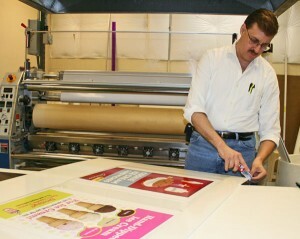 Mounting and laminating are just a couple of the finishing touches we can add to your final product. Whatever your requirements—industrial signage, point of purchase materials, presentation boards, or trade show graphics—we make your message stand out in the crowd! Sintra/PVC – a very durable material that is excellent for long term use; offered in a wide range of colors, available in 1mm – 6mm.